While digital diplomacy has become the “talk about town” in the corridors of ministries of foreign affairs, news organizations and academic departments, scholars and practitioners have yet to find an agreed upon definition of digital diplomacy. Upon searching for such a definition, I learned that some scholars view digital diplomacy as a force amplifier of public diplomacy seeing as how it is a means towards achieving the goal of public diplomacy- creating lost lasting relationships with foreign publics in order to create a receptive environment for one’s foreign policy. The definition of digital diplomacy as a force amplifier led me to identify force amplifiers of digital diplomacy itself. As embassies and foreign missions attempt to reach foreign audiences, the question that soon arises is how can these audiences be reached and how can an embassy continuously increase its audience base. In order to answer this question, I examined the social media accounts of a foreign embassy located in Tel Aviv which I shall refer to as embassy X. While embassy X is quite active on twitter, averaging several tweets per day, its Facebook profile is quite dormant averaging a few posts per week. These findings are surprising given the fact that Facebook is much more popular in Israel than twitter. If embassy X wishes to increase its audience base, it must first find the most relevant medium with which to engage with Israelis. Thus, the first force amplifier of digital diplomacy is the medium of digital diplomacy. The Mediums of Digital Diplomacy: Embassies and foreign missions looking to engage with large audiences must first learn where such audiences can be reached. In Israel, for example, the vast majority of the adult population can be found on Facebook. However, recent social media reports indicate that Israeli youngsters have begun migrating to other social media platforms such as twitter and Instagram. Therefore, if embassy X wishes to engage with mature audiences, it must dramatically increase its activity on Facebook. If it wishes to engage with younger audiences, it should post new content on its twitter and Instagram accounts that would be appealing to younger Israelis. The table below analyzes Israeli social media usage by age groups. Such an analysis may help embassy X increase its audience base given the ability to tailor messages to specific audiences through the most relevant medium. 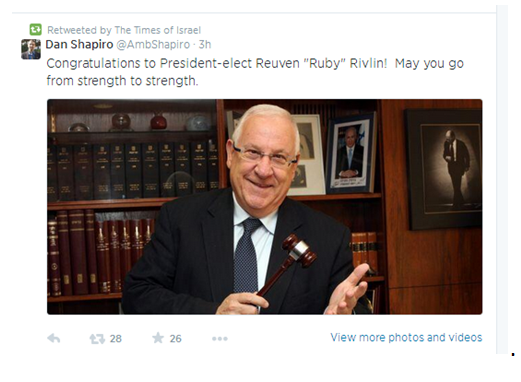 Such re-tweets by the local press are important as they serve as “free advertisement” for foreign embassies looking to engage with Israeli audiences. Readers of articles featuring tweets by foreign embassies are more likely to begin following these embassies on social media. Thus, If embassies wish to increase their audience reach, they must analyze their own social media accounts and learn which journalists and news organizations follow them. 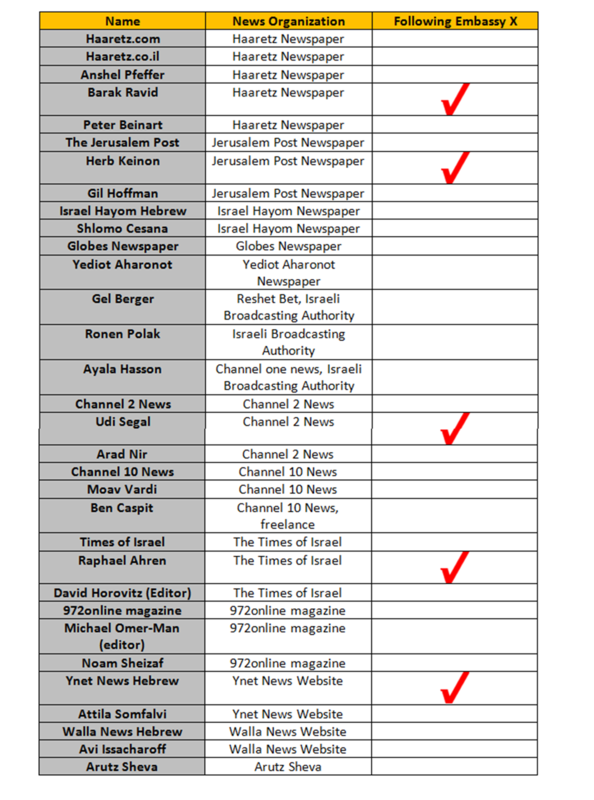 The table below includes such an analysis with regard to embassy X and Israeli news organizations and relevant journalists (i.e., foreign affairs commentators). As can be seen, embassy X is followed by only three journalists and one news organization. By tweeting at the news organizations and journalists listed above, and inviting them to follow the embassy’s social media accounts, embassy X could increase its reach amongst the local press and use the local press as a force amplifier. The Local Diplomatic Community: In the world of twiploamcy, embassies and ambassadors follow their peers. Embassies looking to increase their audience could use their peers as force amplifiers. For instance, embassy X has some 1,300 twitter followers. The US embassy in Israel has more than 20,000 followers. A re-tweet from the US embassy would expose embassy X to more than 20,000 potential new followers. Thus, embassy X should begin tweeting at the US embassy and tweet information relevant to joint initiatives between country X and the US which would most likely be re-tweeted by the US embassy. In this manner, the local diplomatic community may also serve as a force amplifier of digital diplomacy. 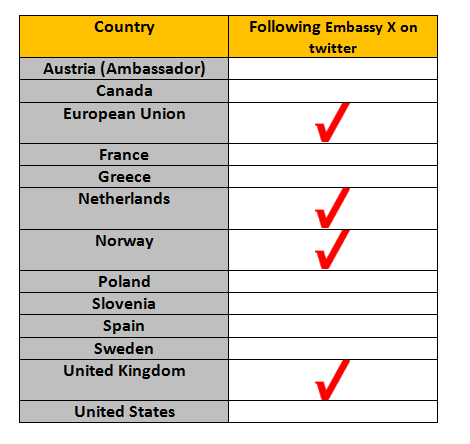 At the moment, embassy X is followed by less than half of the foreign embassies to Israel that are active on twitter. Using the local diplomatic community as a force amplifier requires than embassy x first reach out to all foreign embassies that are active online and invite them to follow embassy X’s social media accounts. Online Groups: Finally, another important force amplifier of digital diplomacy is online groups. In the case of embassy X, there are many ex-pats from country X living in Israel that have formed online groups on Facebook. By engaging with such online groups, and publishing content that is relevant to them, the embassy could use these groups as force amplifiers as they would likely share such content with their own online followers. Posted in Uncategorized and tagged digital diploamcy, force amplifiers, Israel, Social media, twiploamcy. Bookmark the permalink.